Panasonic's Toughpad FZ-M1 is solid in terms of both build quality and performance, and it's also quiet thanks to a reliance on passive cooling. Other plus points include a bright display and swappable components, which you may need to take advantage of thanks to lacklustre battery life. An enterprise offering, it also comes with a business-class price tag. 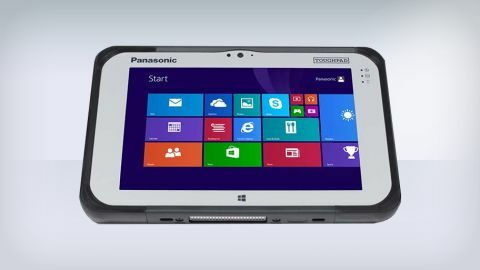 Unveiled at CES 2014, the Panasonic Toughpad FZ-M1 is a rugged Windows 8.1 tablet that arrives in the mould of the company's 10.1-inch FZ-G1, only in a more portable 7-inch package. Like the much larger Toughpad 4K that sits above it in the ever-expanding Toughpad range, the FM-Z1 has been engineered for durability. Aimed at enterprises and those who need a robust tablet capable of taking a few knocks and scrapes, its chunky demeanor and higher price tag place it in an altogether different category to lifestyle devices such as the iPad Mini 2 with Retina and Nexus 7 (2014). It's expensive too with a starting price of GBP £1,183 or USD $2,099 (around AUD $2,358). But, if you need both mobility and toughened design in a small-screen tablet, in addition to the abilty to run both legacy desktop programs and Windows 8.1 apps, it's the one to beat. The FZ-M1 isn't exactly glamorous, but we've seen much less attractive rugged tablets. It measures 18mm thick - around the same as laptops that are a little too chunky to be classed as Ultrabooks - and it possesses a solid, muscular feel in the hand. At 540g, it's lighter than you might expect considering the level of ruggedisation on offer. The display is surrounded by two bezels. The first is a magnesium alloy chassis on the inside that houses the Panasonic logo, the Windows logo (which accesses the Start screen), a 720p front-facing webcam (there's also a 5 to 8-MP rear camera) and LED power and battery status indicators. The second is a matte black outer bezel that forms part of the protective outer casing and holds the power and volume buttons. The display sports a pixel-resolution of 1280 x 800, which has proved a common choice on many 8-inch Windows tablets released in the past year. A pixel-per-inch (PPI) ratio of 216 means that text is sharp and clearly legible, but not quite on the same level as Apple's iPad Mini with Retina (326 PPI). For the FZ-M1's vastly different intended use cases, this is to be expected. Readability is helped by the display's high brightness levels of 500 cd/2, which is bright enough for outdoor viewing. The display features 10-point multi-touch which provides an alternative way of interacting with apps and the desktop. The screen is a little too small to prod at desktop elements comfortably, and if that's something you'll be doing often, you'll want to opt for the optional Touch Screen Pen that comes attached on a removable Tether cord which provides pinpoint accuracy. Our model came with Windows 8.1 Pro (64-bit) installed, which is available alongside a Windows 7 downgrade option. Internally, the FZ-M1 is powered by a dual-core Intel Core-i5-4320Y vPro processor clocked at 1.6GHz that's backed up by 4GB of RAM (upgradable to 8GB, which our test model housed). The device is also available in another version featuring a Celeron low power CPU that runs standard Windows 8.1. The FZ-M1's nippy 128GB SSD showed no discernible slowdown as we prodded and swiped our way through Windows 8.1's charms and menus, opening apps and streaming 1080p YouTube video. Usage remained smooth even with video playing in the background and 10 tabs open in Google's Chrome Browser. After a fresh install, 82.3GB is available on the device, which may be a little on the small size depending on your needs (a 256GB version is also available). The CPU is a low power variant of the latest generation (Haswell) Core i5 processor, which posseses a power consumption of just 4.5 watts, removing the need to reduce heat. Panasonic used passive cooling techniques to ensure a fanless design, as the inclusion of a fan would have led to a hole in the device, making it impossible to waterproof. The machine is incredibly quiet as a result. Something that might be a concern when it comes to productivity is the device's average battery life. Our PCMark 8 battery life test eked just short of six hours out of the device before it gave up the ghost, meaning you'll need to carry around a swappable spare battery to achieve all-day usage. The FZ-M1 offers a healthy amount of connectivity options - including 802.11 a/b/g/n/ac Wi-Fi, Bluetooth 4.0, one USB 3.0 port, a micro SDXC card slot, docking connector and optional 4G LTE. It's also available with optional dedicated GPS, Ethernet, serial port and NFC. The Micro SD and micro SIM slots are hidden behind a protective door in the battery compartment, and a connector for a vehicle dock can be found along the bottom edge. The FZ-M1 is MIL-STD-810G certified, meaning it can withstand drops of up to five feet and is protected against shock, vibration, altitude humidity and extreme temperatures, according to Panasonic. It's also the first tablet of its type to sport a fanless design, allowing it to meet IP65 standards for rain and dust. It's impossible to detect any flex anywhere on the device, such is its construction. However, while it's certainly durable, simply being carried around in a bag for a couple of weeks accumulated a few minor, albeit permanent dents in the screen. It goes to show that while the device is unlikely to actually break, the display isn't guaranteed to remain free from cosmetic damage. The Panasonic Toughbook FZ-M1 shines where it counts for business users and field workers thanks to its durable build, ability to run legacy Windows apps, impressive performance and vibrant, highly readable display. You could say that those plus points are to be expected considering the considerable outlay, and there's still plenty of room for battery life to improve (though this is alleviated by batteries being hot-swappable). The bottom line is this: if your business is prepared to stump up the cash, the FZ-M1 is a superbly excecuted business tablet that will find its way into many challenging corporate environments.